The nS01 is designed for high reliability systems and for ensuring in rugged environments in addition to high performance, low power consumption, optimal MTBF for 24/7 systems working in extreme hostile conditions. 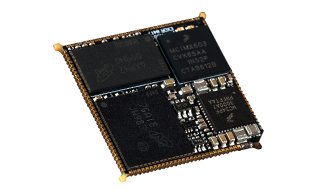 The nS01 nanoSOM is extremely compact smart SOM design and makes easier with great flexibility to design a new generation of Smart IoT products, such as modern Human Interfaces , Smart IoT Controllers/Gateway, Cloud edge interface, Web smart product, with a very simple carrier board design. The nanoSOM is ultra smart and rugged solution, soldered directly onto the main carrier board, without the use of expensive connectors that will reduce reliability of the system. Optional JMobile software platform, enable to design a User-friendly and high quality vectorial graphic (SVG) and HTML5 rich-graphical GUI, it assures a device connectivity with suite of +200 communication protocols. The Exor SOM Product Longevity program ensures a stable supply of products for your embedded designs. SOM products are available for a minimum of 10 years from product launch and are supported by standard end-of-life notification policies. Longevity products remain in the program even if the manufacturing site changes. If we transfer a longevity product from existing qualified factory to another facility, we re-qualify the product to maintain its status in the Exor Longevity Program.